What are Ad Manager Tags? Admanager tags is a feature that allows you to add tags to jobs. Tags can be anything, from client names to priority levels - anything you like. 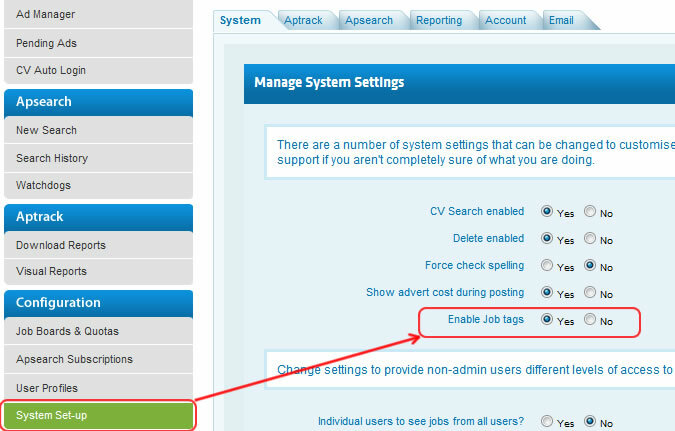 You can then filter your jobs by the tags you define to view - for example, all adverts belonging to a particular client. Aptrack and Apsearch clients will already be familiar with tagging, and this latest upgrade means your tags can be used at all levels around the system. You will first have to enable the proper option in the system set-up. This is done on an admin account and activates tagging on the whole account. After that you will have a few new options in idibu. and hit the enter (also known as return) key on your keyboard to save the tag! If you want to add a tag, that was already assigned to a different position, just start typing the tag's label. An auto-suggest box will appear and clicking the desired tag will quickly assign it to your position. You can easily remove a tag by hovering over it. An "x" will appear and clicking it will remove the tag.